Each November, thousands of writers participate in the National Novel Writing Month (NaNoWriMo) challenge. They commit to writing 50,000 words of original fiction - or about 1,700 words per day, every day, for an entire month. If you're thinking about trying it, here are a few tips. I work best when I have a strong sense of my characters, and plot the story from a broad arc down to individual scenes. From there, I write scenes organically from notes like "Tom and Nancy argue about whose turn it is to cook dinner. Tom loses." As early as September, I flesh out my characters and story. By the end of October, I usually have the story arc nailed down and know my characters reasonably well. I even know most, if not all, of the scenes I plan to write. When NaNoWriMo starts, I'm ready to write on Day One. I started NaNoWriMo 2012 with only a very vague story idea (see Tip 1). I had a basic arc and vague character notes. I planned to write the story organically. By the time I hit the 35,000-word mark, I'd stalled. I hated the story, and the characters seemed like featureless robots trudging through a series of pre-programmed actions. At this point, something surreal happened. One of the characters in the story turned to me (the author) and said that he thought the book was boring and he wanted no part of it. This started a (written) dialog between us that ended over 15,000 words later, finishing my 50,000-word goal. At that point, I knew my characters and their world far better. Since having that strange experience, I've learned that many professional authors "talk" to their characters, getting to know them intimately before writing a single word of their story. As crazy as it sounds, it's a great way to see and hear your character in action. Imagine that it's November 15, the half-way point. You've written 25,000 words, and realize that your male lead character should be a female instead. What do you do? Going back and revising your existing text could take hours or days, putting you behind schedule. From this point, write as though the character has always been female. After you hit the 50,000 word goal, go back and fix the earlier text. Adding the note gives you a subconscious "permission" to keep writing and serves as a visual indicator of where to stop making the changes later. Sometimes I have trouble visualizing a scene. Perhaps I've imagined a scene where a man named Joe storms into the office of his boss, Bill. I know that Joe is mad about something. He wants to punch Bill in the nose, but thinks better of it and leaves the room. Although I know this happens in my story, I'm having trouble seeing all the details. I'm not sure what's going through either character's head. I'm not quite sure what Bill has done to Joe. I can't even picture Bill's office clearly. Bill looked up to see the door burst open. Joe rushed into the room, his face inches from Bill's. Joe was clearly angry. Joe pulled his arm back, his hand clenched into a fist. When he realized what he was about to do he lowered his arm, turned, and left the room. This scene won't win any literary awards, but it serves a purpose. It allows me to move on and write the next scene. I can always come back later to expand and embellish this scene (increasing my word count in the process). Many professional authors do this. Rather than halt the creative process, they write a basic version of the scene to move the story forward. Later, they improve the scene by adding better description, dialogue, etc. When I first attempted NaNoWriMo in 2009, I worried a lot. Would the story be any good? What would people think of it? Would I reach the 50,000 word goal? What if I didn't? Would that mean I failed? Eventually, though, I overcame the fears and finished the story (such as it was). No one has ever read the train wreck of a story I cranked out that year. In fact, I'll probably delete it. All that fear, paranoia, and depression was for nothing. 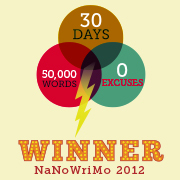 I've completed NaNoWriMo successfully four times now. None of the stories I've written compares to those by Ernest Hemingway, Isaac Asimov, or Stephen King. But each one gets a little better, a little easier, and less stressful. Relax and enjoy NaNoWriMo as much as you can. No one has to see what you've written until (or unless) you want them to. No one even has to know you're participating in it. Let go of the fear, or let it propel you to write. Just don't let it stop you. National Novel Writing Month is about proving to yourself that you can write a novel. It's about the feeling of satisfaction you get when you look at the file on your computer, or the stack of pages in front of you, and realize that you wrote that story. If it never wins an award, never gets published, or is never read by another human being, so what? You did it. You wrote a book. It should also be fun. Take risks. Write crazy, wild stories. Create strange and amusing characters and put them in outlandish situations. It's your story. Enjoy writing it.